A very long time ago, around 2006, Rick & I found a bench that was all beaten up. Rick saw the potential and carefully took it apart and threw away the rotten wood. He carefully wrapped up the side pieces even though they were rusted and chewed up. He put them away in our basement and waited. When we started to pack for our move to Richmond, he looked at those pieces and decided that they were still worth saving. 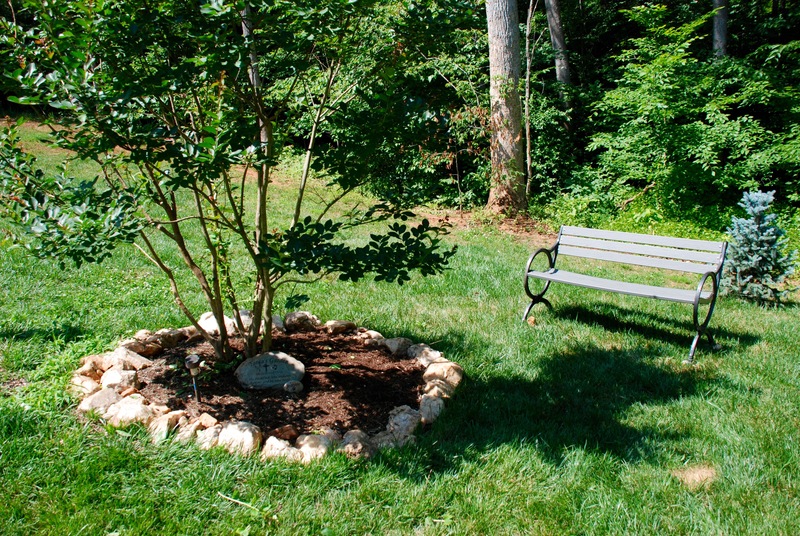 As he watched me put in the memorial garden for Tonia, an idea began to grow. He saw the Crepe Myrtle tree in the garden, he saw the bird feeder and then he saw the Blue Spruce Christmas tree that I call the Sean & Yelena tree; he realized that there was a missing piece. A place to sit and reflect. A place where conversations could happen in the future. So he unwrapped the sides of that old bench and started stripping away the years of rust. He sanded them slowly, stopping to buy a new tool to get into the grooves. He stripped them down to their original form. Then the fun began. Together we spray painted them a matte black. They came alive again. This past Saturday while I was out with my dear friend, Donna, Rick carefully measured, cut and installed the seat & back of the bench! It had been reborn! He took it outside and placed it mid way between the two trees. He took a picture and sent it to me! I was teary and overwhelmed at this gift. It was a gift of time, a gift of understanding and a gift of self. It was his way of saying “I Love You. I can’t take away the pain but I can share it with you.” This is what marriage looks like when God comes first and He is at the center of the marriage. When I look at that bench I feel loved. But I also see God’s hand in our lives. We had to be stripped down to our original state, we were covered in grace and reborn in Him! Our lives have taken on a new look and a new purpose. So like that old bench we were saved by God and even through the trials there was a plan for the future! Rick I love you! Thank you for my bench and your love!